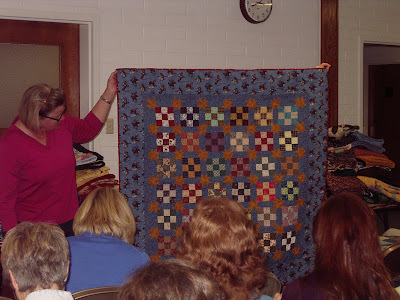 This month's trunk show was by Joylynn Cluny. 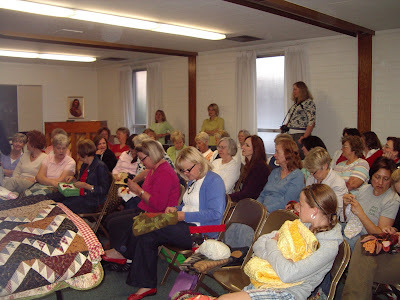 I think she lives in the Salt Lake County area and she brought a friend and her machine quilter with her. It was a really nice presentation. 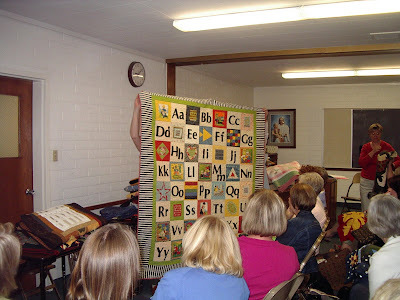 She is a very prolific quilter and her quilts were well done and interesting. This is Joylynn on the left and one of her friends on the right. 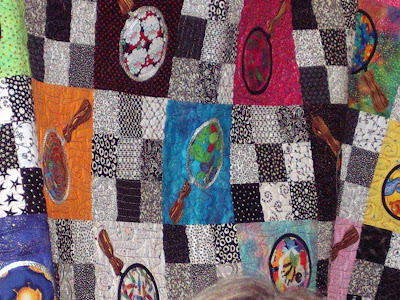 I can't tell you how many quilts she brought but my 20 pictures are only a sampling of the total shown. 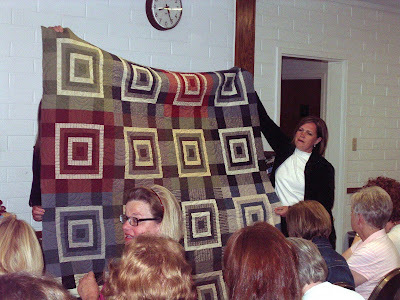 These 2 above are obviously the same quilt in 2 different color combinations. 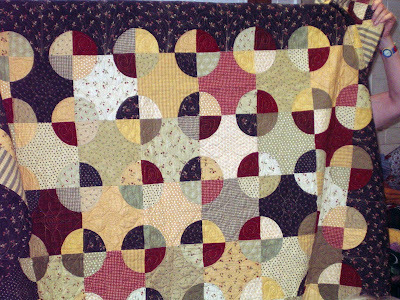 I have made this quilt before. Its Grandma's dishes from Blackmountain Sea Side Cottage book. Out of print, though, I think but its still around, I'm sure. My version was given to my daughter Whitney. I thought this was a really clever way to make a bee out of a black button. Sweet, huh? This was one of my favorites Joylynn showed. I love aprons and love vintage. 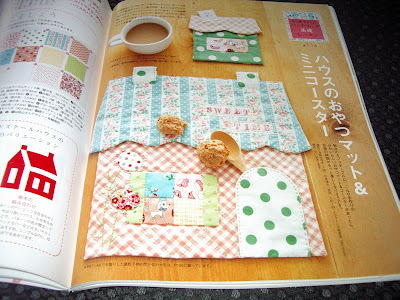 It is a darling quilt. 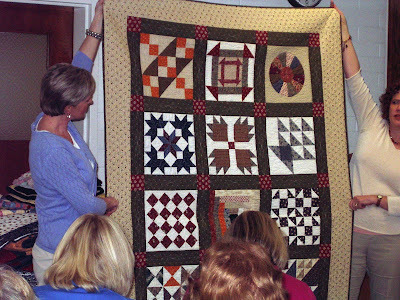 It is a pattern by a local quilt designer, Lori Holt called Apron Club. 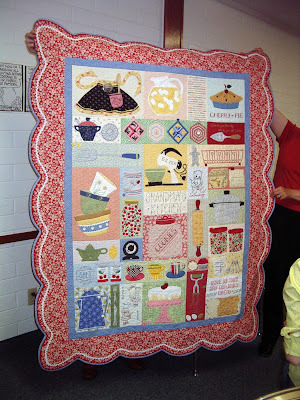 This is another Lori Holt quilt called Grandma's Kitchen. I've got this pattern, too. Always wanted to do this one as well. Hey life's not over yet. There's time? 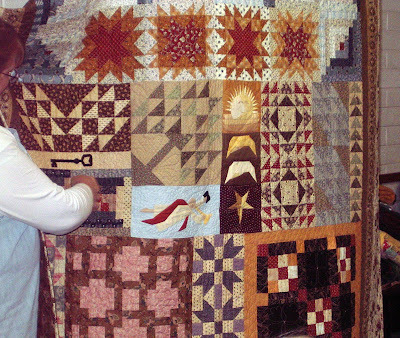 This is also a design by a local quilt artist based on the life of Joseph Smith. 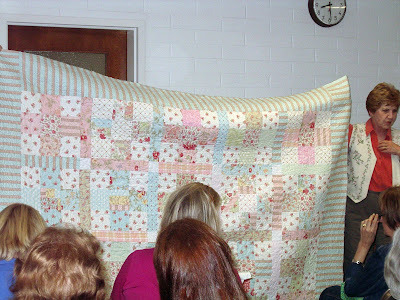 I thought this quilt was cute but apparently I didn't get a picture of the whole thing. 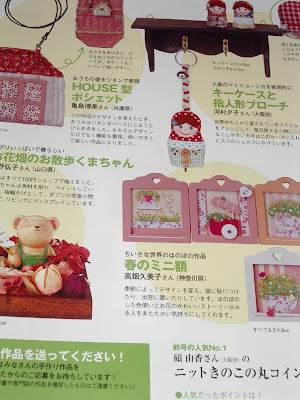 It is a sewing themed quilt. 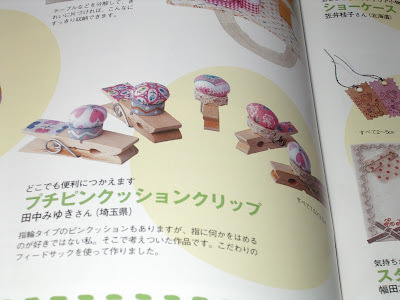 I thought it was clever that she used a washer for the blade of the rotary cutter. 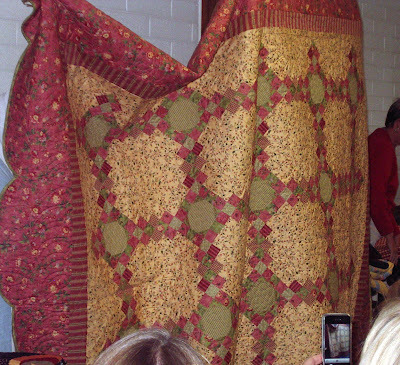 The whole quilt was clever, really. 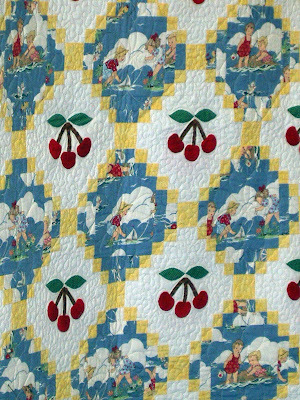 This is the cover quilt from the Seaside Cottage book by Teri Christofferson. 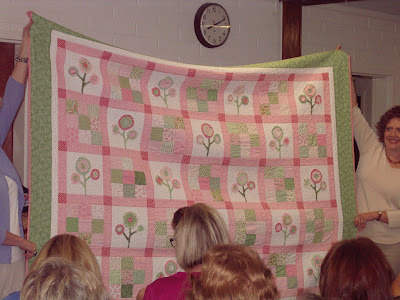 I've always wanted to make this quilt. 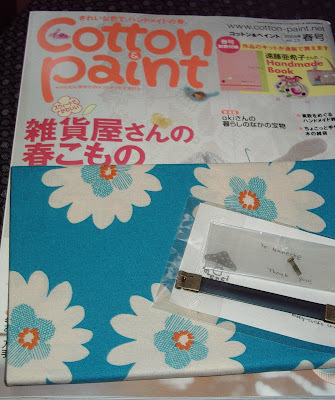 I may even have this fabric. Gotta love those cherries. 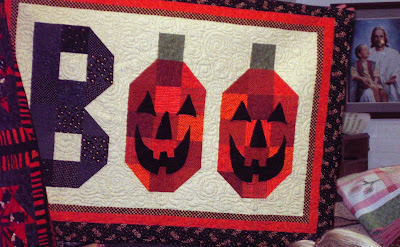 I thought this was a fun quilt. 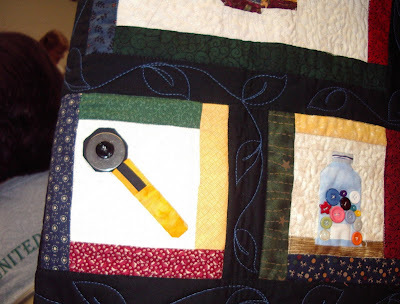 Its obviously an Eye Spy quilt but she combined back ground fabric and the fabric in the magnifying glass that was similar so that it looked like the magnifying glass was really showing detail from the back ground fabric. I hope that makes sense. 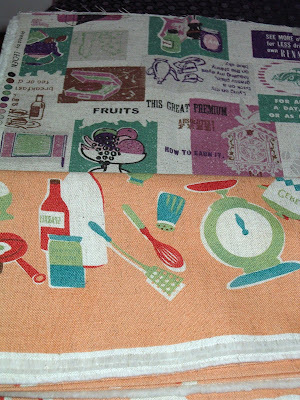 Anyway, cute quilt. I think I have this pattern, too. No quilt though. 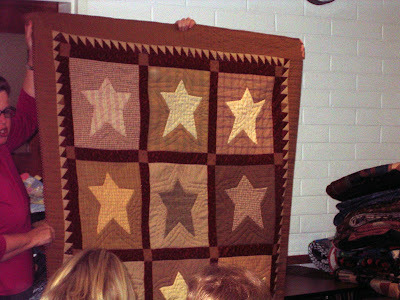 This last quilt was brought by Joylynn's friend Kathy Young. 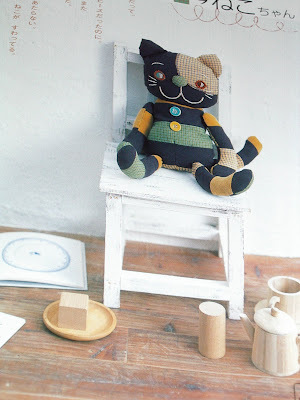 She is a machine quilter. 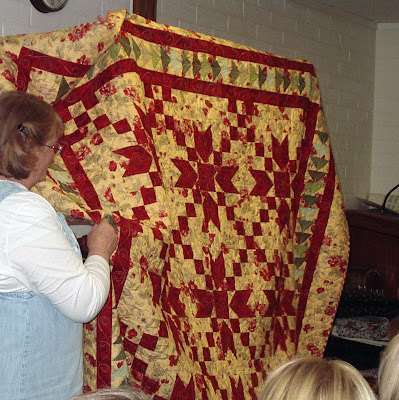 This quilt was made to remember her mother by. It was very sweet. I belong to a really fabulous group of women in my town/area. We meet together on the last Tuesday of every month in a room of one of the church buildings in town. There is usually 40-50 women that attend month to month and the faces aren't always the same but there is a core group and peripherals that evolve and revolve. Some of the women have met for 20+ years. 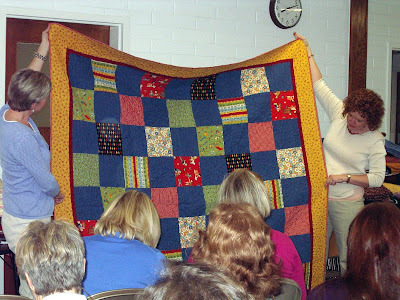 They are all amazing quilters and the quality of quilts that are produced here in town is nothing short of amazing. So here is my report from our last meeting. 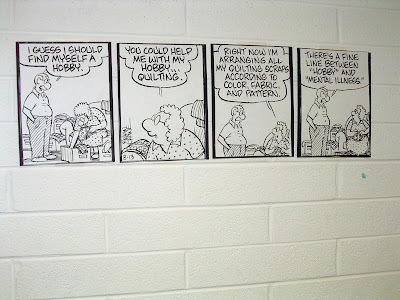 This cute cartoon greeted us on the wall. I hope you can read it. Is truer than we'd like to all believe I think. You can't see everyone in this shot but it gives you a general idea. The room is fairly packed. Up first every week is group show-n-tell. And its great. I'm always so impressed and I enjoy the differences we each bring to the collective. In between "oohs and ahhs" we usually stitch or take pictures. 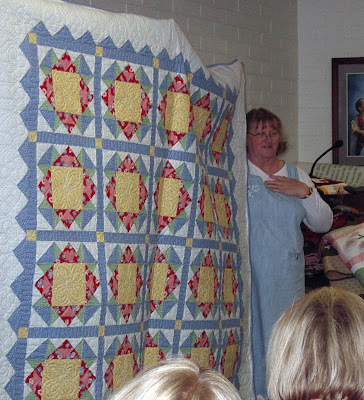 These 3 quilts were made by Dixie Andersen. 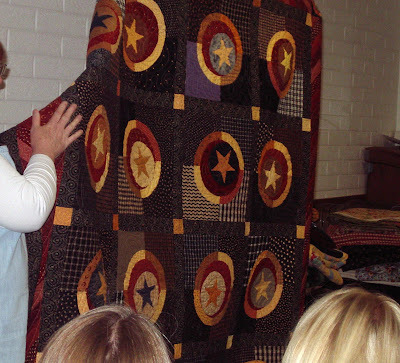 They were all really nice quilts. And she machine quilts them, too, on her long arm. This is Flora. Flora and Paula share the responsibility of organizing and having a presentation every month. Paula calls Flora the sheriff. Flora is my great pal. And she "gets me". Everyone needs friends that understand them and I think we really "get" each other. I don't know what I'd do without her. 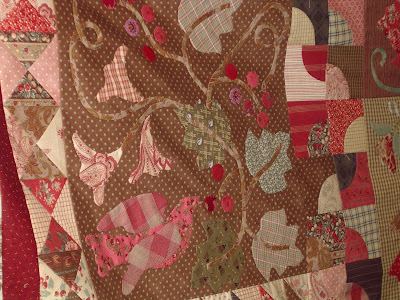 This is a recently finished cowboy themed quilt Flora made. 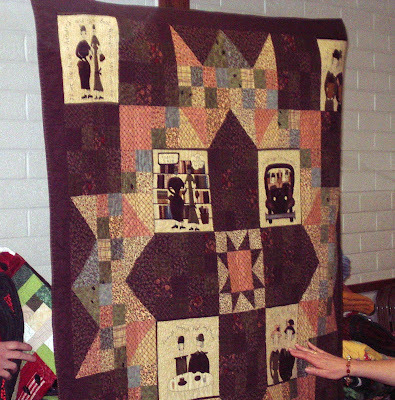 And she happened to finish another cowboy themed quilt as well to show. Both of them are darling. 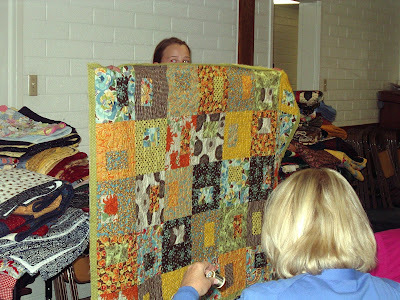 This is Paula peeking out from her Utah snowflake quilt she just completed. The reason Paula calls Flora the sheriff is that then she gets to be the deputy (and not the sheriff). But they really share the job very well. Without them there would not be a group such as it is. Truthfully I think neither of them love to be in charge so they squabble about who is going to be sheriff and deputy. And its funny. 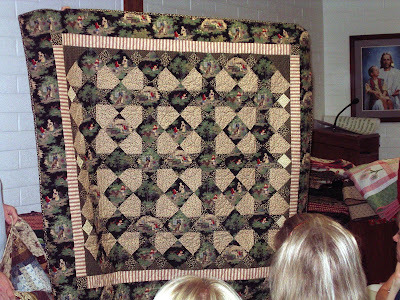 This is a quilt by Laurel. You can see her in the far right. 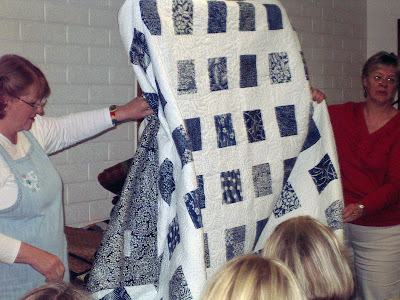 She's an exceptional quilter and teacher. 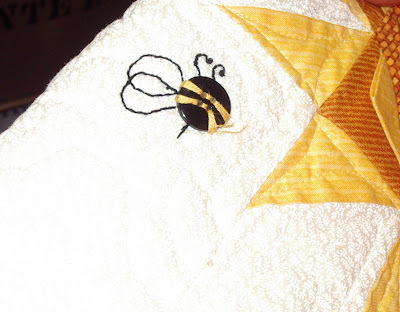 I took my freezer paper applique class from her and it was great. 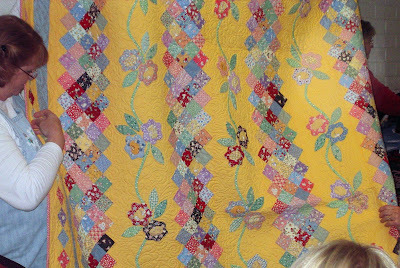 This is an attic windows quilt that is 2 sided. 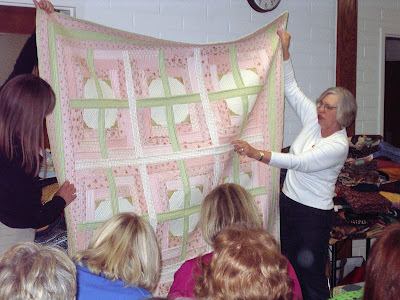 Its one of those quilt as you go and turn under the edges quilts. It was quite heavy and quite pretty. 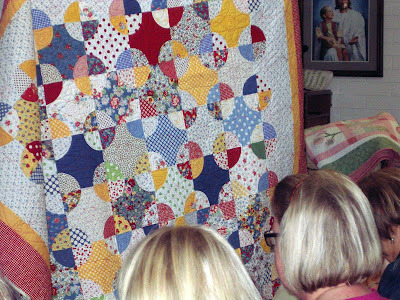 Her quilting lines were really straight. This is the other side. 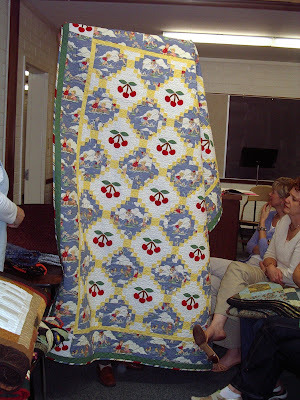 It is a very nice quilt but I'm not sure I'm game enough to try that process. 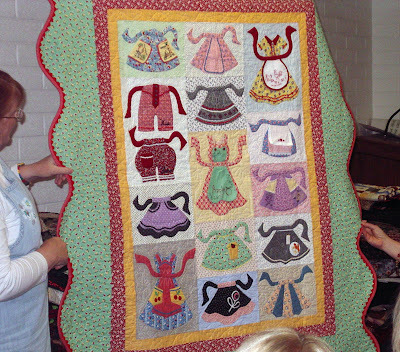 This is Paula's daughter Clair's first quilt. She's a cutie and I think it turned out so well. 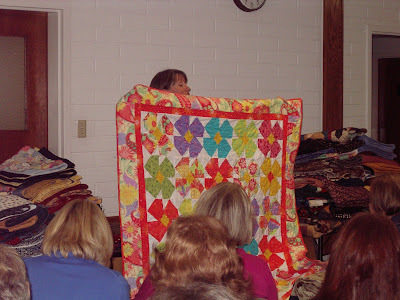 If you look behind Clair you can see the quilts stacked for the trunk show that followed show-n-tell. But more of that tomorrow. I seem to have gotten the back of Sherry in nearly every picture. Sorry Sherry. 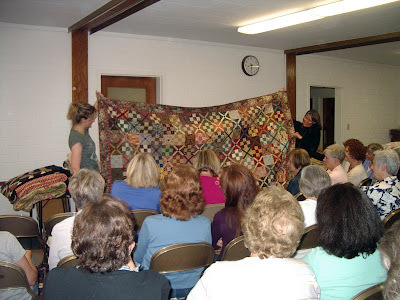 Her is Laurel helping Janice (far left) hold up her quilt top she just finished. 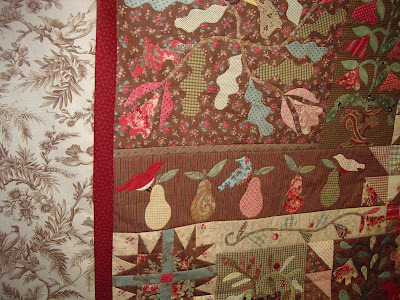 The quilt is Birds of a Father. 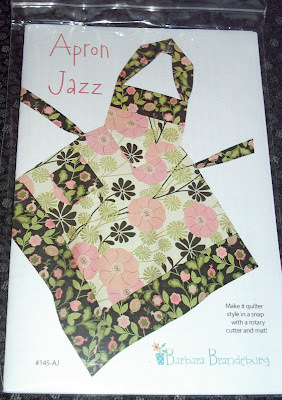 Janice is a legend in needle turn applique. She's fantastic. 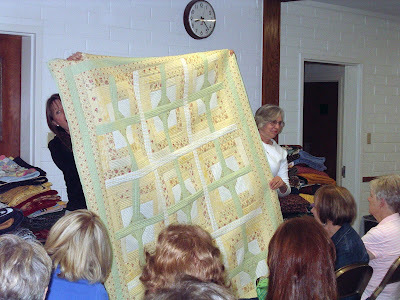 She orders the fabric for Broadbent's, a local quilt shop, and she and Laurel both teach there. Their work is fantastic. Amazing, isn't it. I can't wait to see it quilted. This is the famous Bonnie Miles. 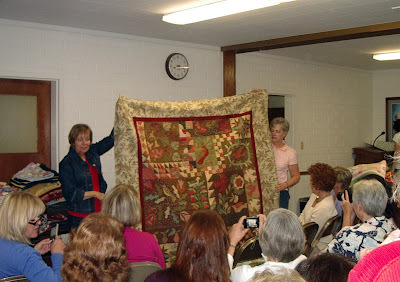 Bonnie teaches everywhere and takes groups to Lancaster County on quilt tours. 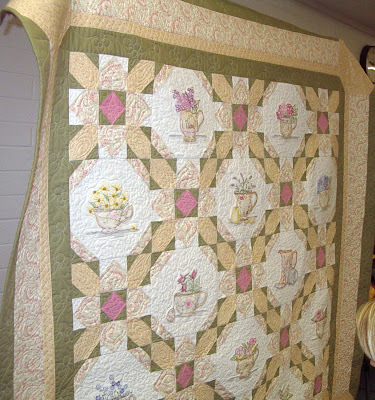 This is one of her latest lovelies I think she made it with a Jelly Roll. I can just picture how pretty that would be on the top of a bed. 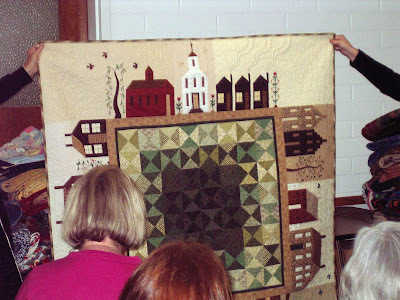 This quilt was a block of the month for each building. It is just darling and done so well. I think this is another from the same quilter. You can see Flora turning around to tell me that next time I need to get there early and sit up front so I can take better pictures! Save Laura and a seat next time Flora! 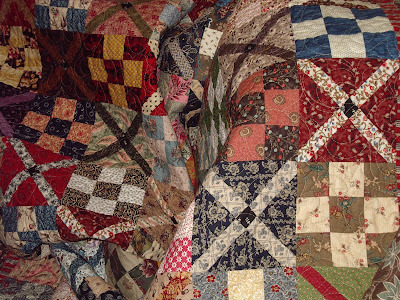 These two shots are from Judy Spears' quilt. 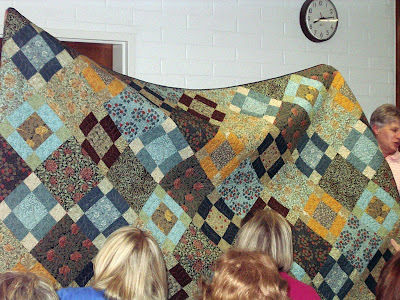 She combined 2 years of block exachanges to make this huge quilt. I'm sure she probably still has blocks. One year was the albumn cross and one year was the 9 patch. They go together so well.